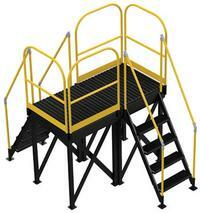 This Modular Work Platform System can be configured to fit any application needed. Platform legs have a fixed height and provide stability to the entire modular unit. Designed for maximum loading capacity of 500 lbs. Combined stair / platform configuration has a maximum capacity of 1,000 lbs. Fixed height ladder sections attach to platform. Individual grip steps are 24"W x 7"D with 10" step height. 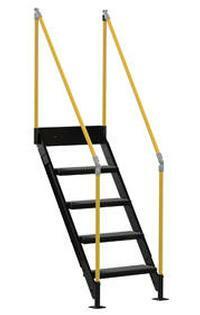 Each ladder includes round tube handrail which features a midrail and 4" toeboard. 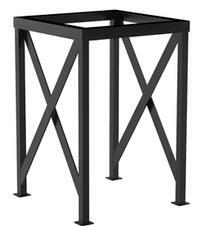 Constructed of industrial grade welded steel with a powdercoat finish. Meets OSHA specification 1910.23. 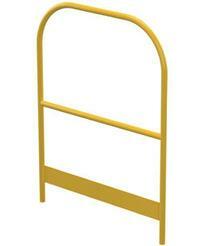 Concrete wedges available for securing unit to floor. Hardware is included for easy assembly. All components are sold separately.